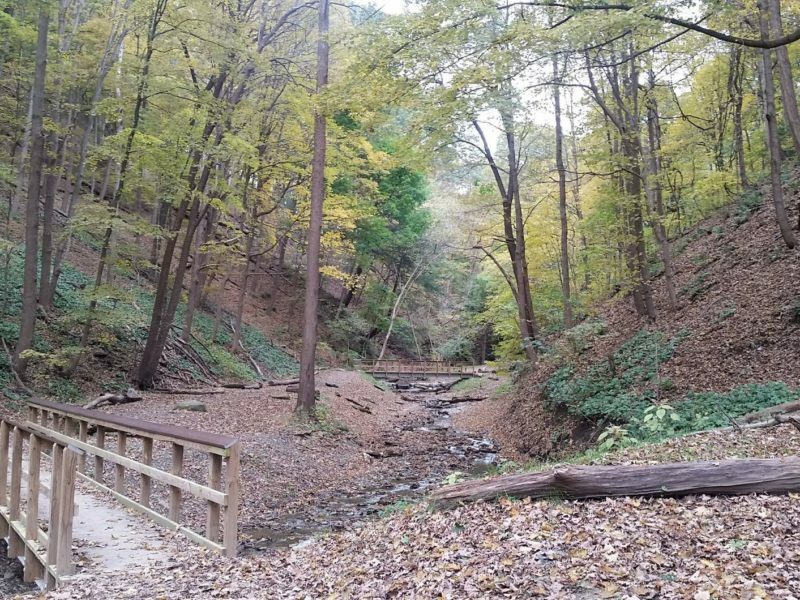 Fall Run park is a hidden gem, located just off Route 8 in Glenshaw. It’s been recently restored after having been damaged by storms, and now the popular trail also features many bridges as it criss-crosses the stream, leading hikers to the waterfall, located about half a mile in from the main parking lot. You can continue up a set of steps to view the falls from above and continue your walk a bit further. The trail ends in a residential area, with a small parking area, so could be done in reverse, if more convenient. There is creek access at this park so it’s also a popular activity to put on water shoes and clothes and skip the trail in favor of walking in the shallow creek up to the falls, where you’ll often see families and dogs splashing in the water. This park is beautiful in all seasons. It is especially pleasant on hot days since it’s shady and has water access. There is also a playground near the entrance to the park, though not immediately adjacent to the parking area. Keep in mind that if you go up the steps to the top of the waterfall, there is open access to that drop, so be sure to keep an eye on anyone who might be inclined to investigate. This trail can be prone to mud, so mud-friendly footwear is recommended. Plan ahead to bring water-clothes or a change of clothes on hot days so you can splash in the creek, or hike the creek the whole way. Enjoy the many bridges that cross back and forth over the creek. At the waterfall, there’s a natural rock waterslide you can try if you’re feeling brave! If you’re not sure of the route, you’re sure to see someone try it eventually. 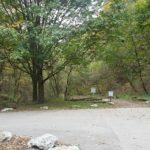 The main parking lot for the trail is at the end of the park off of Route 8. Turn off Rt 8 onto Fall Run Road (across from Harley Davidson), make the first left into the park, follow the road straight (playground is on your right) until you reach parking on your right. The trailhead is at the end of the parking area. Julie has been an Ambassador for Hike it Baby since summer 2015. 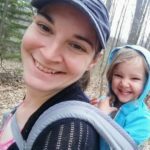 She and her husband, Andrew, started hiking with Hike it Baby in January 2015, when their daughter was just 6 months old.